I think it’s about time for a RAFFLE! Festivals are one of my top things to do when I’m out of town, so when I have a few days off automatic na #bookit! It’s awesome to hang out with friends in such a lively atmosphere, and since this one is going to be in “the city of smiles” I expect it to be all the more fun! 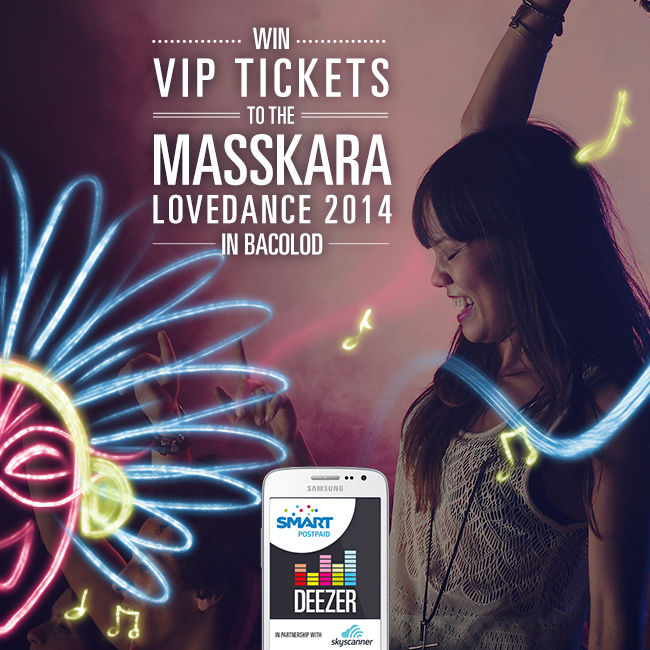 Smart Postpaid, Deezer and Skyscanner want to bring you and your friends to MASSKARA! 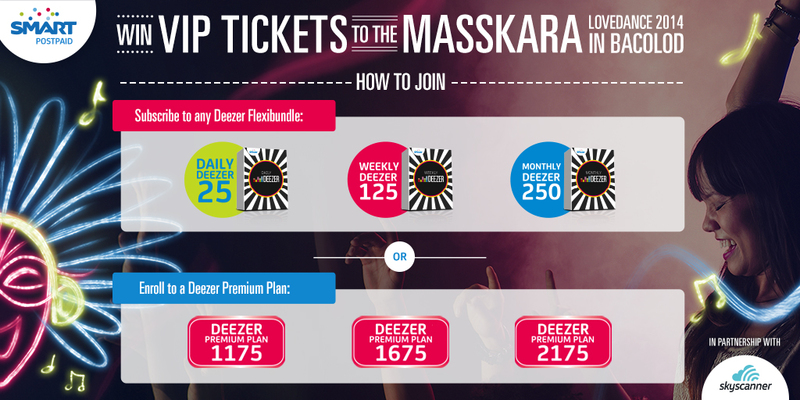 You earn a raffle entry when you subscribe to a DEEZER bundle or DEEZER Premium plan! So aside from getting the best music from around the world onto your phone with the most reliable network in the country, you get a chance pa to win a festival package! Different DEZEER Flexibundle equals to different prizes! 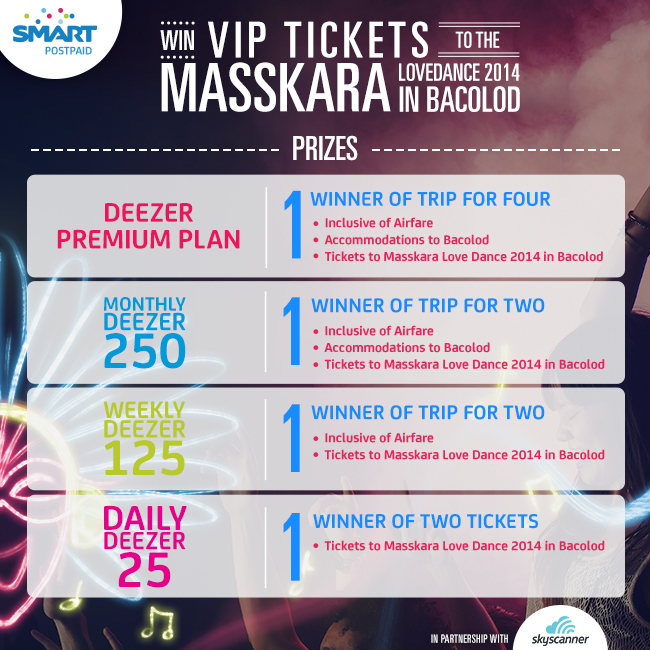 Entries are automatic when you avail of a DEEZER bundle so it’s so hassle free to join! I wouldn’t take my sweet time though since this is only until September 30, 2014! Trip to Bacolod, seeing the sights, fantastic local cuisine (try the chicken inasal and piyaya) and a non-stop party? I’m in! #Smart always comes up with the best parties and events in the Philippines, so be sure not to miss out on this one! Deezer has the widest music library, hard to find music, OPM artists and songs, as well as newest releases and is incredibly easy to use. But don’t take my word for it, subscribe now and discover a whole new world of music just a touch or swipe away!